I have had Twitter since even before I got Facebook as far as I can recall. I admit, as a beginner it was a tough cookie and back in the day it was much much harder to figure out since nobody I knew was on it. It took me 3 years to actually use it and that was the time when I made this blog. However, it was only last year that I actually upped my networking game and around this time of the year, or maybe even a little late, I started participating in Twitter chats. I knew they existed, but I wasn’t really into them until I saw Noor Unnahar, who is my lovely friend from Noor’s Place blog, hosting her own Twitter chat called #socialbloggers one fine Saturday night. I enjoyed the session she held so much that I started chatting more frequently with other bloggers. That chat was also the reason why we got closer and this is how I found her twin, Areeba Siddique, too who blogs at Not Your Type blog. 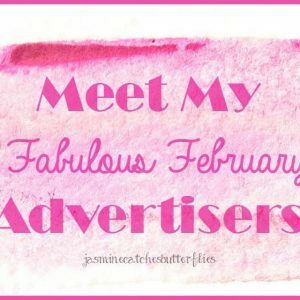 So, I chatted a lot all throughout the second half of 2014 and this made so much of a difference in my blog traffic, plus I made some more international blogger friends too. Then around Nov/Dec, Areeba and I discussed that we really do not get to see much of Pakistani bloggers on Twitter and even if we do have a huge active group of local Twitterati, we don’t see them interacting as such with bloggers from the other parts of the world. This was the ice that we thought had to be broken as we would like to see our own local blogging community gaining international recognition. Hence, for months the idea of our own Twitter chat had been in the pipelines and late in July we retouched upon the issue. Then thanks to Noor for pushing us for real to get it started and last week was the debut of our own Twitter chat, named #bloglanders. I had invited all my friends to join me for the chat last week and knowing that Areeba had to travel back home earlier than planned, I was kind of nrevous to host all by myself. 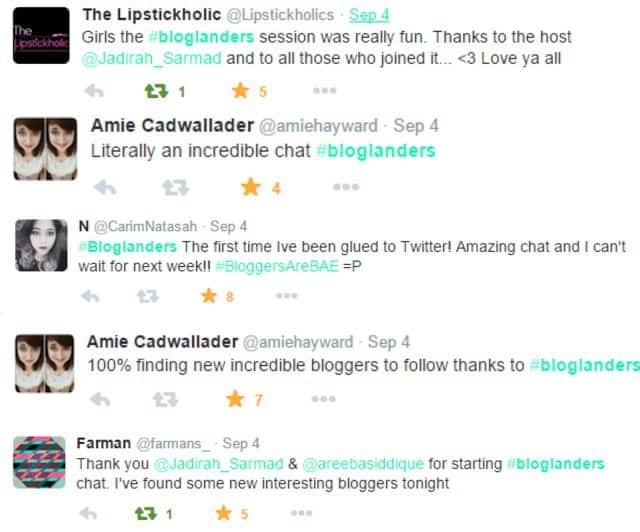 I have hosted a #PABChat session previously but since #bloglanders is a new born, I did not expect as many people to show up. However, the turnout was great and in no time my feed was flooding, so I am very grateful to everybody who particpated and supported us through and through. 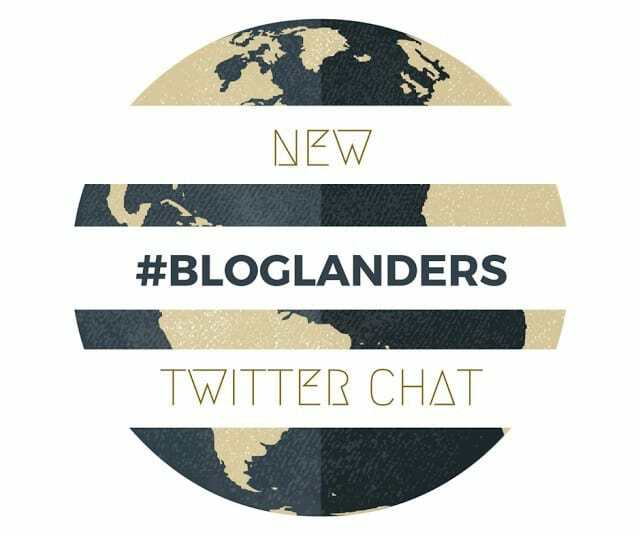 Bloglanders, is the new Twitter chat on the block, about the bloggers and we do mean to focus on bloggers more than blogging itself as there are already so many chats doing that. Since, this is a new venture, we would welcome and appreciate all sorts of suggestions related to topics. 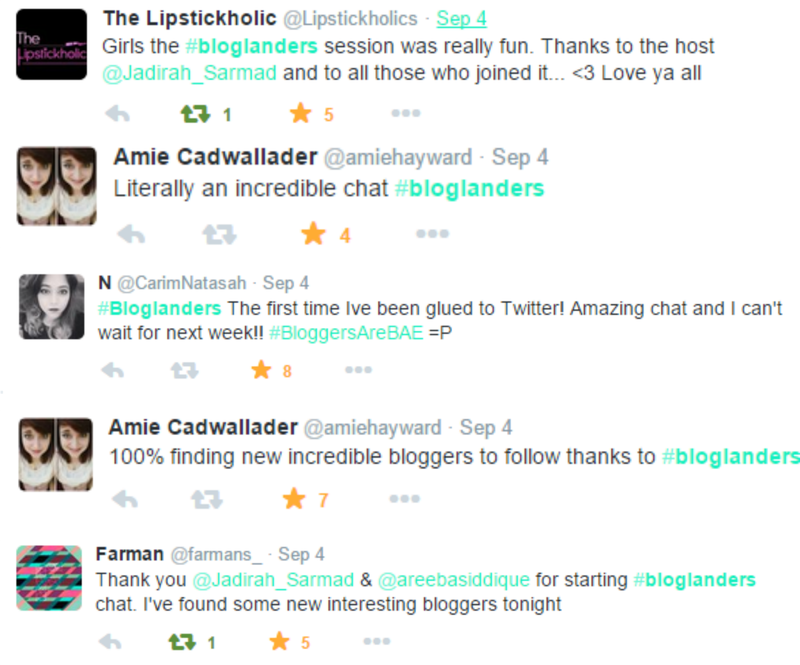 This chat is for all the bloggers around the world, no matter your niche. So join us every Friday, and we shall have a great time socializing. 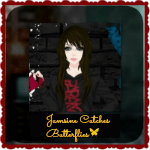 Also, this week onwards we will be giving a surprise shout-out to a blogger at the beginning of the chat as our token of admiration for their work. We are both the hosts of the Bloglanders since we cofounded it but each week either one of us will be asking all the questions so that it doesn’t get confusing during the session. We will announce the topic and which one of us will be hosting a few hours or a day in advance. Don’t forget to add this in your tweets to stay in the chat loop and to also follow our questions. Send in your creative submissions for Bloglanders to Areeba so that she can feature you in her upcoming Zine! The theme is ‘Relationship with Your Blog’, you check here for details. 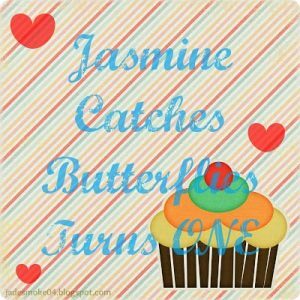 It’s My Blog’s 1st Anniversary! I am just SO proud of you two. 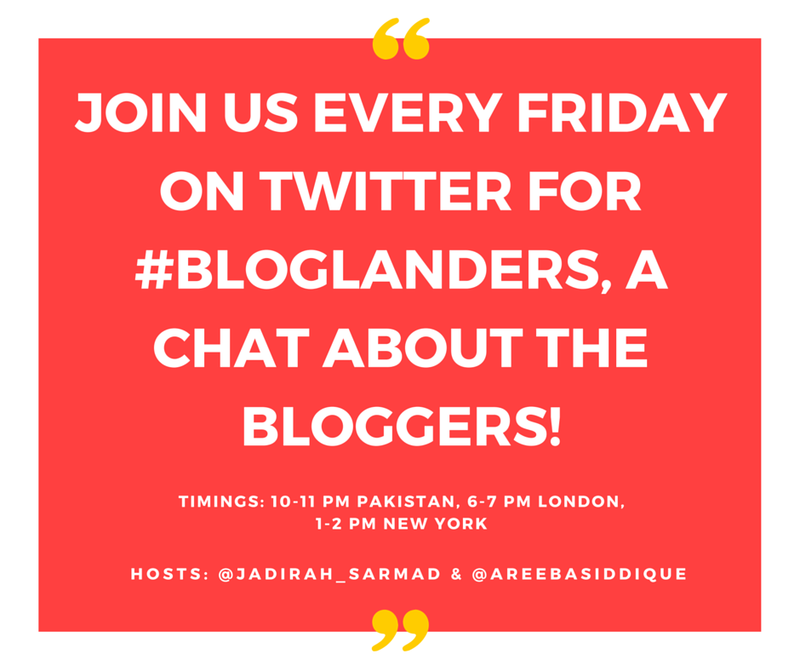 This is the first twitter chat for bloggers in Pakistan (which isn't sponsored, haha!) and beyond. I have been lacking a solid present from my own chat. I hope #bloglanders will motivate me even more to get active in Twitter's blogger community. High five!!! Amazing concept ♡♡ Thumbs up for you two ?? it was such a fun activity .Twitter is the least used among Pakistani bloggers without any doubt ,but such acticvities make it a great platform for every one . though I just steered off from the track, but i will be showing up more ! Love you for this! :* It was too much fun. Thank you guys! If I ever get a day off, I'll be sure to join in because I'd love to meet more people from around the world! here's to hoping I get a day off on a Friday soon so I can try and join in this chat… that is if I even remember ? I will definitely remind you next Friday! Oh wow! I hope I can join you today! Sounds great!